Much of Kentucky's hilly terrain is populated by dense forests of hardwood trees. The Appalachian plateau region is an area with an especially diverse mixture of tree species. Identify Kentucky's trees by determining if the tree is deciduous or evergreen. Then consider leaf shape and color and any other unique characteristics--such as bark, fruits or flowers. Conifer species are generally evergreen and have needle-like or scale leaves. The Eastern white pine (Pinus strobus) and Virginia pine (Pinus virginiana) grow throughout Kentucky, except in the Mississippi Embayment region and the Bluegrass region. The Eastern hemlock (Tsuga canadensis) has soft, feathery evergreen leaves that form a flat, horizontal spray on the twig. Bald cypress (Taxodium distichum) is classified as a conifer, but drops its bright-green, feathery leaves in the fall. Toothless simple-leaved trees growing in Kentucky are identified by their round or elongated leaves that grow one leaf to a stem. The leaf edges are smooth. Eastern redbuds (Cercis canadensis) are identified by their heart-shaped leaves. Flowering dogwoods (Cornus floridus) are bronze-green to yellowish-green in the summer, with brilliant purple or red fall foliage. Two magnolias are native to Kentucky, the bigleaf magnolia (Magnolia macrophylla), which produces leaves 24 inches long, and umbrella magnolia (Magnollia tripetala). Kentucky trees with toothed, simple leaves are identified by oval or round leaves with a textured edge. The black cherry (Prunus serotina) grows wild throughout Kentucky and produces black fruits. The American beech (Fagus grandifolia) also grows throughout the state. It is recognized by the well-defined veins that run through the leaves. American beech leaves turn bright yellow in the fall. American holly (Ilex opaca) only grows in the Mississippi and Appalachian Plateaus regions and is characterized by its red winter berries. Lobed, simple leaves are intricately shaped leaves. 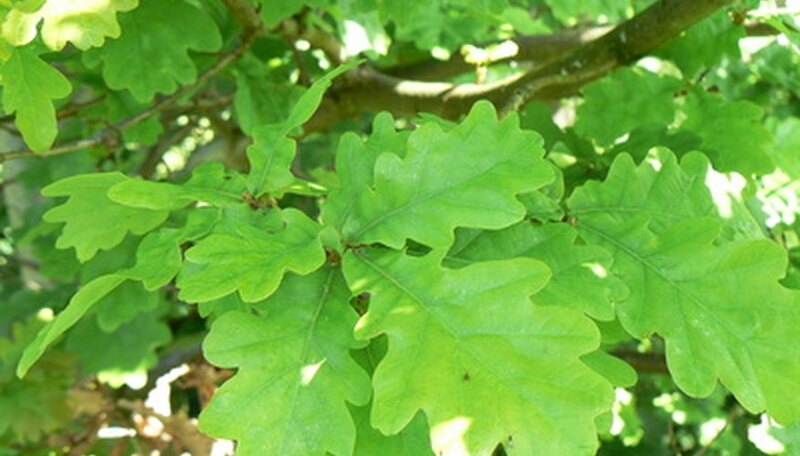 In Kentucky, trees with lobed, simple leaves include several oak species, such as the pin oak (Quercus palustris), the white oak (Quercus alba), the scarlet oak (Quercus coccinea) and the northern red oak (Quercus velutina). The red maple (Acer rubrum) and sugar maple (Acer saccharum) have a typical star-shaped leaf and brilliant fall foliage. Compound leaves are identified by clusters of leaves growing from one stem. In Kentucky, many trees with compound leaves also produce nuts, such as the Ohio buckeye (Aesculus glabra), the yellow buckeye (Aesculus flava), the shellbark hickory (Carya laciniosa) and the black walnut (Juglands nigra). Note: The nuts of buckeye trees are toxic to humans.